It was always thought that almost anything with the Star Wars name attached to it would turn out to be a mega box office hit. 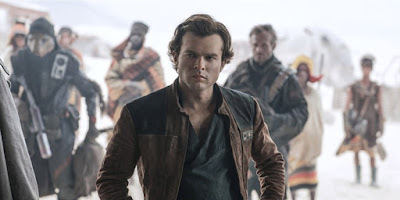 Sadly for the troubled Solo:A Star Wars Story, interest waned and the film is turning out to be quite a disappointment for Disney and their massive investment in the Lucasfilm brand. Opening within months of the divisive The Last Jedi, Solo is having a tough time riling up audiences over the holiday weekend. When many families are on vacation or out at the bbq get together, the tale of a young Han Solo may take the number one spot, but the film is not living up to expectations in the slightest. Weeks ago it was touted that Solo's ticket pre-sales were spiking higher than Black Panther's. But now that the film has opened, people are reporting nearly empty theaters as well as poor receipts from theaters themselves. Initially estimated to make between $130-150 million over the course of the Memorial Day weekend, the film will now only gross $101 million with it absolutely flopping in China, where it will only make slightly more than $10 million in its opening frame. Total worldwide sales for the entire four days looks to be only $148 million which is a far cry from previous Star Wars entries. Comparatively, Rogue One opened with $155 million and The Last Jedi opened to $220 million domestically.